Sunday December 2nd 1883 I went to church this morning and over to see how Mary was soon after dinner. Hatt and Edith were over and a couple of young ladies to see me. Mr. Gray who boarded here last year took supper with us. I played on the piano the most of the evening. 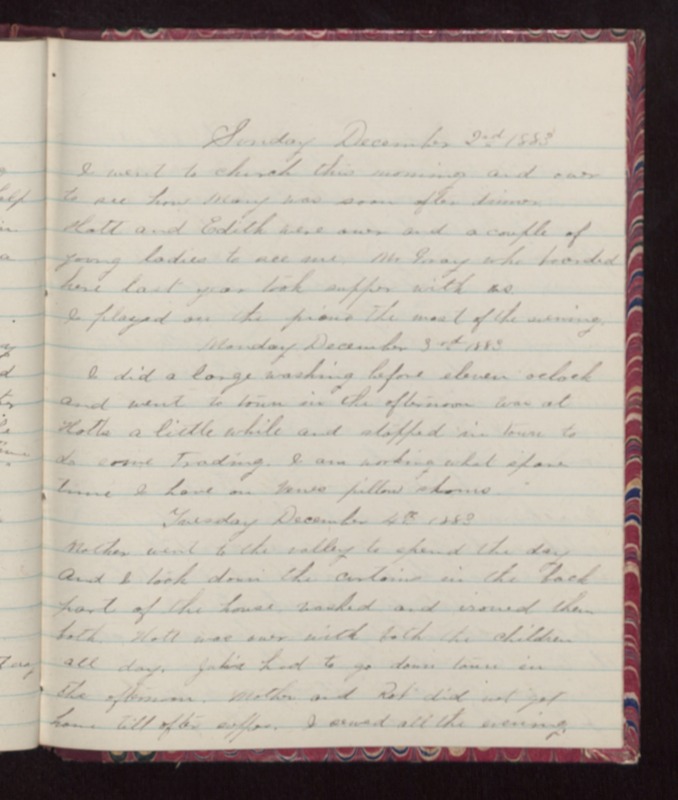 Monday December 3rd 1883 I did a large washing before eleven oclock and went to town in the afternoon was at Hatts a little while and stopped in town to do some trading. I am working what spare time I have on Venes pillow shams Tuesday December 4th 1883 Mother went to the valley to spend the day And I took down the curtains in the back part of the house washed and ironed them both. Hatt was over with both the children all day. Julia had to go down town in the afternoon. Mother and Rob did not got home till after supper. I sewed all the evening.